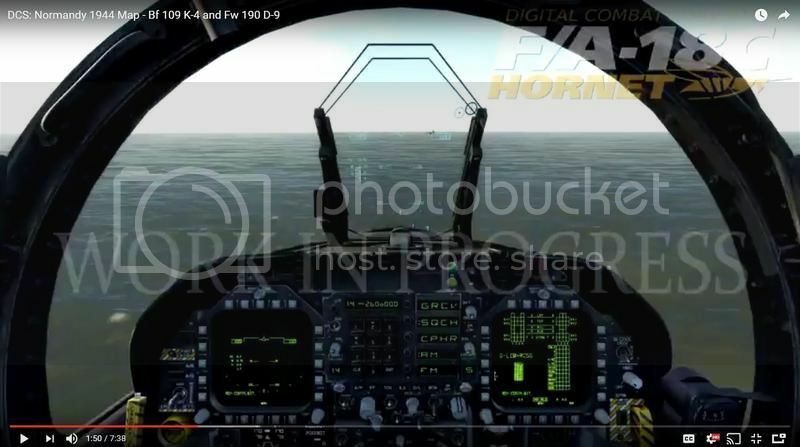 Screenshot of the upcoming DCS Hornet,More News will follow a few weeks after Normandy Map is released. Should be some solid news in a few weeks,after the release of The Normandy Map. Does anybody know if the new Hornet module is going to have a carrier for carrier ops built in? Or is it just the aircraft itself? They should show some carrier action with the coming DCS F-18, carrier launching and trapping is what folks will buy this addon for mostly. 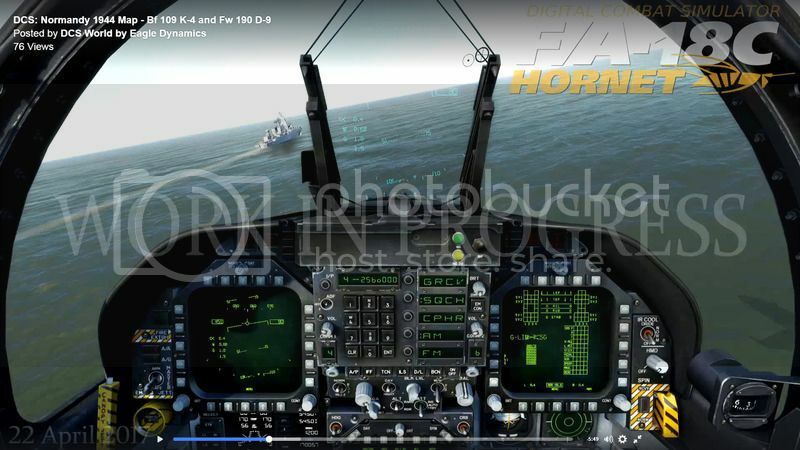 *****Mini update from Wags****** "Hey everyone, I answer this everyday on FB and YT, but I wanted to provide a little update here as well regarding the next Hornet video (start up). Most of the primary systems we need for an authentic cold start have been completed like electrical, hydraulics, fuel, AMAD/ATS, engines, display groups, and most sounds are done. There are certainly areas though we still plan to improve like the IBIT, DDI/MPACD fonts, cockpit art, and some sounds. The big item we are still working on, and thus this hold up, has been the caution and warning system. This is a very complex system for the Hornet and the team has now completed most of the coding logic. This week, the team will hook up the display and control of those notices. Once that has basic functionality is in place, we can move on to the next episode. This brings us one step closer to the next video"
Thank you for all your updates, Phantom88! ***Mini Update from Wags*** "As mentioned earlier, a lot of effort is currently focused on the caution and advisory system. This includes various indicator lights around the cockpit, voice message advisories, and tones. Another element are the advisories that are the displayed in the DDIs with their own set of display logic." Be sure I follow this forum almost every day, although I seldom have something to say. ""While some parts of the team are toiling away on the caution and advisory system, other members have been busy with the Hornet’s navigation system. For the Early Access version, we plan both TACAN and Waypoint steering. Attached you can see a work-in-progress of the TCN system up and running in the game. The guys are now busy with the Waypoint system of navigation. Having a functional waypoint navigation system is another required aspect of the start up video. As I think many of you are starting to see, there are large number of elements that must first come together to create an authentic start up video"
"Although you’ll be starting the Hornet using battery power almost all the time, the ground power electrical bus panel will also functional. However, you’d only really use this during systems tests when you do not want to start up the jet. After requesting external electrical power from the ground crew, you will enable the main external electrical power switch. With external electrical power enabled, you can use the four ground power switches that each controls a separate group of systems/instruments. The control bus for each switch is listed on placard below the DISP button. I’m discussing this now because I probably won’t touch on this during the Hornet Start Up video. Work continues on the caution and advisory system." I asked this question before.. but will this module have carrier ops built in, or will contain only the aircraft? For example, when we get the F-18, where do we find a carrier? There are already carriers available in DCS. You can place them in a mission with the Mission Editor, basically in the same way as you can place an aircraft. In just 24 hours since the Caution and Advisory system was moved into the simulation, the team has already rocketed through almost half conditions. Here you can see the right engine started, but not the left yet. I’m just waiting on a few key audio elements now before I can get started on the Hornet start up video.